It’s just another Manic Monday! It really is manic, so much to do and so little time to do it in! I had a fantastic weekend with Gareth. We went to Healdsburg for my birthday! It was kind of nice to get away from the city to a small town. This town is full of tourists, but it’s still not as bad as San Francisco. We had such an amazing meal and some amazing wine! I will write about all of this on Friday, so that if you ever want to go to Wine Country, you can plan accordingly! If you haven’t done so yet, you should go to last Friday’s post and visit all of these awesome contributors and make their drinks! What are you plans for the week? Anything special? I know that we will be packing for our move and that’s pretty much it. This is our last week in this apartment! I am so excited to move! What is your favorite desk and chair? I’m in the market for new ones! This week I am going to try to be very minimal on our meals, so that we don’t have a lot of food to move. I’m so excited to have a bigger kitchen and a pantry. You guys, city living is really hard sometimes, my kitchen right now is so tiny, it’s hard to make you guys fabulous new recipes in that tiny kitchen! 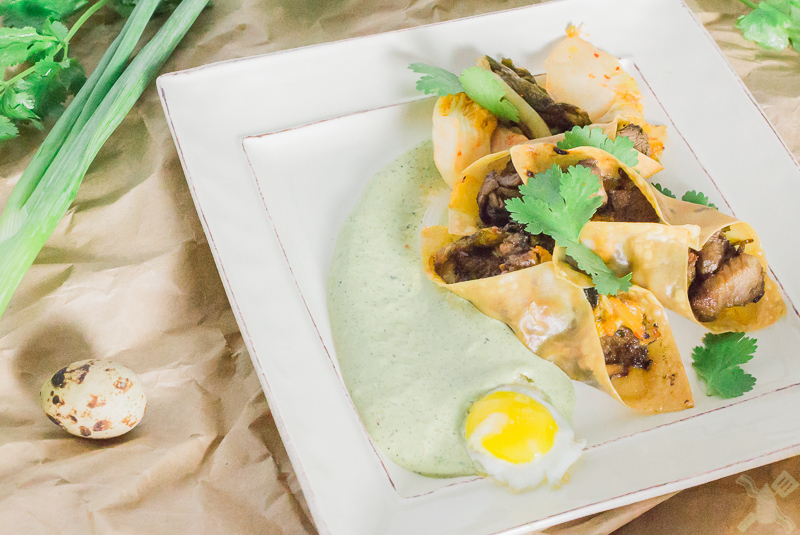 For my birthday, I made us bulgogi tacos with caramelized kimchi and a cilantro aioli, it was the first meal that I got to photograph with my new lens, so I decided that it should be the recipe of the day! Bulgogi style strip steak marinated for a few hours and cooked to perfection, served with caramelized kimchi, and cilantro aioli. Unfortunately, when we got home Braedon’s little teeth hurt and he was a little sick. It made the relaxation kind of go out the window, but I’m really glad that I got to spend some alone time with Gareth, we really needed it. And you know, wine is good too! We have one week left of my give away! To enter, you must comment on the original post about it, follow me on Instagram, Facebook, or Twitter and show me your favorite recipe that you’ve made from MomNoms. Whoever wins will get The Minimalist Baker’s new cookbook, which is full of amazing recipes! This Wednesday, I’m starting a bi-weekly series on cooking from another blogger’s cookbook. I will announce the book and the first recipe this week!! Follow me on Instagram, Twitter, Facebook, and Pinterest! And subscribe to this wonderful page for updates! I do love my readers! So what’s on your plate this week?